This AidCamp was held in conjunction with our partner organisation Rural Community Development Programme (RCDP) in the rural village of Chitrasari in the Chitwan valley region of Nepal. The village primary school in Chitrasari was destroyed by floods 18 months previously. 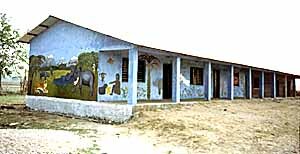 The government provided two classrooms and this AidCamp financed an additional three of 97sq.m (1080sq.ft) to accommodate the 200 children attending the school. 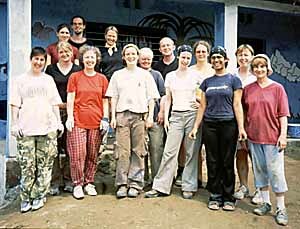 The major construction was completed by local labourers, paid for by the AidCamp, before the group arrived. 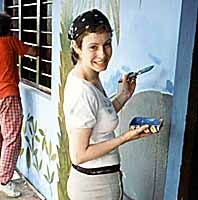 The volunteers set the floor and plastered, painted and decorated the building. 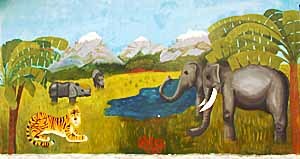 The end of the school was decorated with a landscape scene with elephants, rhinos, and a tiger, reflecting the wildlife in the local Chitwan National Park, while the front walls included, at the teachers' request, scenes of children washing their hands, throwing rubbish into a litter bin, and a map of Nepal. The volunteers were also taken on visits to see other projects in the area, as well as on several local and regional sightseeing trips, during one of which they got to experience Holi, the Hindu festival of colours. "Initial anxieties about whether I had done the right thing and whether such a diverse group would gel were soon forgotten. Nepal is a beautiful country and her people hospitable and kind. Despite the polarity of the group's background, personalities, and ages we bonded quickly. The newness of the situation and the over-riding desire to help a community so much poorer in material wealth than our own was a unifying factor and the team gelled. The scope of the project was initially rather overwhelming; laying floors, rendering walls and mixing concrete using a spade were totally new experiences though our Nepalese co-workers were infinitely patient, helpful and remained in good cheer. Conversely, our chain gangs and a rather energetic rendition of 'the twist' amused our co-workers who eagerly joined in. The pride and sense of achievement felt when we handed over the finished, painted, school after three weeks of hard work was particularly rewarding. Would I do it again? Yes, without hesitation! This project has been one of the most physically and emotionally rewarding experiences of my life to date. It was a timeless experience - focusing on the physical job at hand enabled me to switch off from my 'normal day-to-day' life and, though exhausting at times, I felt totally relaxed and re-charged. I got much more from this experience than I could ever have imagined. The introduction to Nepalese culture was fascinating and my respect for the richness of their close knit communities immense. It was also an honour to have worked with, and been part of, a team who were tirelessly hard working, always friendly and, above all, wonderfully compassionate. I have learnt a lot from this experience, not least to use a mechanical concrete mixer in future!" "It exceeded my expectations. I have had an amazing experience." "I had a wonderful time. It was great to be able to make a difference at a local level and feel part of the community for a short time. Not having any experience or qualification meant this was ideal for me." "A great way of seeing the real Nepal. I don't think an ordinary holiday could match up to this experience." "Wonderful way of switching off. Tons better than being a tourist." "It was a wonderful human experience: the warm welcome of the locals, the smiles of the children, the friendly collaboration with the workers, the understanding local customs. We achieved the project in the best of atmospheres and had lots of fun." "To see the smile on the face of a child who has very little is a profoundly grounding experience. What do westerners have to complain about?" "An amazing experience in so many different ways, but it was the people who made it unforgettable." "Great experience, great people, good friends. Will come again!" "Physically rewarding, culturally stimulating, socially fascinating." "For me working on the AidCamp project in Nepal has been an incredible journey on the path of life. One which has left me with a real sense of achievement knowing I played a small part in a great team who have done so much for the benefit of others." "This was an excellent experience. I would recommend it to anyone. Particularly useful if you can't take too much time out, but want to see more of the world!" "Great experience. It gives you a sense of achievement and that your help is of real importance, while at the same time allowing you to relax and get to know a country from a completely different perspective." "It exceeded my expectations. I have had an amazing experience." "I had a wonderful time. It was great to be able to make a difference at a local level and feel part of the community for a short time. Not having any experience or qualification meant this was ideal for me." "A great way of seeing the real Nepal. I don't think an ordinary holiday could match up to this experience." "Wonderful way of switching off. Tons better than being a tourist." "It was a wonderful human experience: the warm welcome of the locals, the smiles of the children, the friendly collaboration with the workers, the understanding local customs. We achieved the project in the best of atmospheres and had lots of fun." "To see the smile on the face of a child who has very little is a profoundly grounding experience. What do westerners have to complain about?" "An amazing experience in so many different ways, but it was the people who made it unforgettable." "Great experience, great people, good friends. Will come again!" "Physically rewarding, culturally stimulating, socially fascinating." "For me working on the AidCamp project in Nepal has been an incredible journey on the path of life. One which has left me with a real sense of achievement knowing I played a small part in a great team who have done so much for the benefit of others." "This was an excellent experience. I would recommend it to anyone. Particularly useful if you can't take too much time out, but want to see more of the world!" "Great experience. It gives you a sense of achievement and that your help is of real importance, while at the same time allowing you to relax and get to know a country from a completely different perspective."